Tiree is known as Tir an Eorna, the island of barley; however during the 19th century dried ling and cod were a major export from the island. This was long line fishing from wooden boats built on the island. The lack of a natural safe harbour on Tiree combined with the conditions at sea influenced the type of boats that were built. The fishers are mostly always poor. The fishermen of Tyree have many hardships to brave. They have only small boats for the fishing and they have a long distance to go to the fishing ground, about twelve or thirteen miles from land, and the coast is very rough and much exposed to the Atlantic. Ling and cod are the fish they mainly try but sometimes they fish the lobster which they can get much nearer land. The whole of them suffer much through the want of a harbour. Very often they themselves have to draw the boats up away from the beach, especially in rough weather…. They had to be small enough to be pulled out of the water manually and safe enough to fish the banks around Skerryvore. The traditional shape of the Tiree boats was double- ended between 20 and 26 feet long. Some of the larger boats were half-decked but they were more typically completely open. 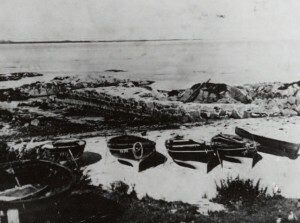 Boats built for the later lobster fishing around the east end of the island were shorter and beamier with a flatter bottom. 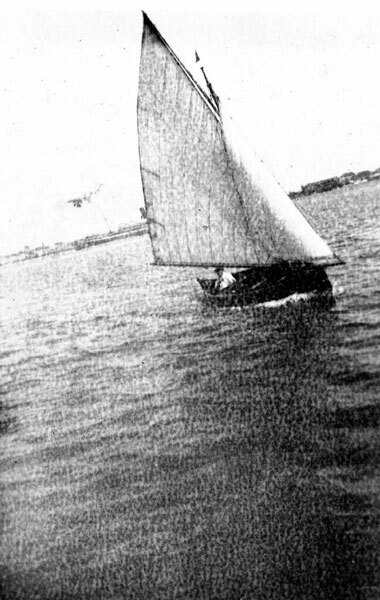 Plenty of stones were used as ballast which made the boats more stable and corrected the ‘trim’ “If the bow was to heavy the boat would steer like a pig – it the ballast was too far back she steered better but there was more drag”. A dipping lug rig was used on these boats. This rig could be set for the long passage out to the fishing banks but could be quickly released for working with the lines or in a sudden squall. In the 1930’s islanders began to experiment with engines. “the first man to break the tradition was the late Johnny Kennedy [Crossapol]. 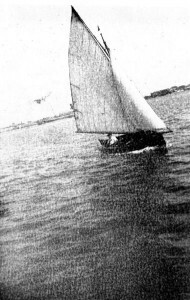 He put an engine in his boat [around 1936]. It was a Ford engine out of a car …” (Angus Munn, Heanish). Flat transom sterns became the norm as outboard engines grew in popularity after the 1930’s. Properly looked after boats could last decades. The inside of the boat was painted every year with tar. 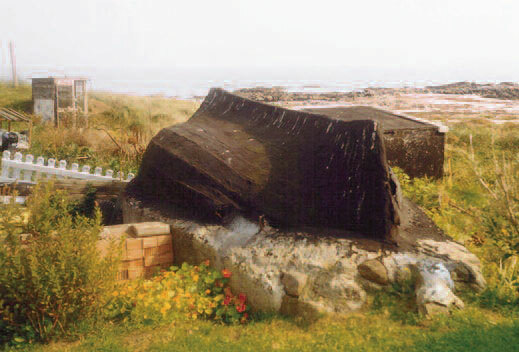 Archangel tar, an tear buidhe was traditionally preferred on Tiree because it was lighter and more watertight than the darker coal tar was used on house roofs. “they were kept together with tar. The bodaich went down and made a fire and a peallan, a lump of rags on a stick. There were plenty of black pots with three legs. I know of one instance where the tar went on fire and the boat burned. The famouns Taeping, she was probably the best of her day …she was burned accidentally at Mannal.” (Angus Munn, Heanish). “The really old boats had been tarred so often…you could hardly see the individual planks on the inside.” (Alasdair Sinclair, Brock). Donald John Kennedy (West Hynish) remembers the old men in West Hynish were very particular about keeping sand out of the boat. You had to wash your shoes and the ropes before getting in. They maintained that the sand got between the planks and rotted them.